"Heart attack" redirects here. For other uses, see Heart attack (disambiguation). Diagram of a myocardial infarction (2) of the tip of the anterior wall of the heart (an apical infarct) after occlusion (1) of a branch of the left coronary artery (LCA, right coronary artery = RCA). 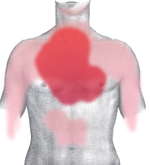 Ing acute myocardial infarction (AMI or MI), o ausan dang ataki keng pusu at keng amanung English heart attack, metung yang sakit a kabilyan nung nu ing mamagus a daya keng dake ning pusu mesabat ya. Ing malyari ing ischemia o pamagkulang oxygen sisiran ne o kaya paten no ring tissue keng pusu. Metung yang medical emergency, at mumunang sangkan da reng pangamate da reng lalaki at babai keti mabilug a yatu. Ing mayalagang risk factor ilapin deng milabas a kasalesayan ning sakit pangvascular antimo reng atherosclerotic coronary heart disease at ing o angina, dating ataki keng pusu o stroke, at nanu pang dating meging e pangkaraniwan a pitig ning pusu o syncope, matua keng idad—lalu na kareng 40 patas kareng lalaki at kareng babai naman 50 patas, pamanyigarilyu, labislabis a pamaninum alak, pamanggamit kareng bawal a droga, matas a triglyceride levels, matas keng LDL ("Low-density lipoprotein") at mababa keng HDL ("High density lipoprotein"), diabetes, matas a prisyun, pamanaba, at pane ing matas a stress kareng mapilan a tau. Classification of acute coronary syndromes. 12-lead electrocardiogram (ECG) showing acute inferior ST segment elevation MI (STEMI). Note the ST segment elevation in leads II, III, and aVF along with reciprocal ST segment depression in leads I and aVL. Angiogram of the coronary arteries. Microscopy image (magn. ca 100x, H&E stain) from autopsy specimen of myocardial infarct (7 days post-infarction). Thrombus material (in a cup, upper left corner) removed from a coronary artery during a percutaneous coronary intervention to abort a myocardial infarction. Five pieces of thrombus are shown (arrow heads). Coronary artery bypass surgery during mobilization (freeing) of the right coronary artery from its surrounding tissue, adipose tissue (yellow). The tube visible at the bottom is the aortic cannula (returns blood from the HLM). The tube above it (obscured by the surgeon on the right) is the venous cannula (receives blood from the body). The patient's heart is stopped and the aorta is cross-clamped. The patient's head (not seen) is at the bottom. A 12 lead electrocardiogram showing ventricular tachycardia. ↑ (2004) The World Health Report 2004 - Changing History (PDF), World Health Organization, 120-4. ISBN 92-4-156265-X. Heart Attack - overview of resources from MedlinePlus. STEMI Systems - Articles, profiles, and reviews of the latest publications involved in STEMI care. Quarterly newsletter. American College of Cardiology (ACC) Door to Balloon (D2B) Initiative. American Heart Association's Heart Attack web site - Information and resources for preventing, recognizing and treating heart attack. Tauli yang miyalilan ining bulung anyang 16:25, 20 Marsu 2017.